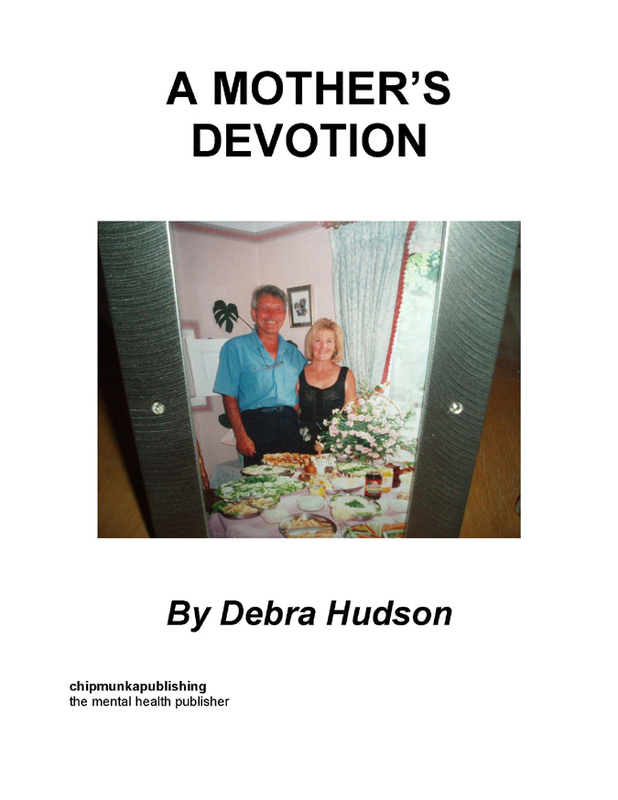 The Book A Mother’s Devotion is about how my Mum supported me from when I was born to the day she died. The book tells of her 39 years of unconditional love and devotion towards me even when I was unlovable. She knew how to deal with me effectively and because of this the challenging behaviour became less and less as I grew up. She supported me when I was being bullied at school, college and work. She spoke up for me at my last job and she also managed to successfully get a formal diagnosis of Asperger Syndrome for me. Her journey towards this was a times very lonely but she never gave up. Her support of me came to an end when she died 8 and a half years ago. Debra Hudson is 48 years old. She was born on 22 May 1963 at St Frances Maternity Hospital, London Road, Leicester. She was born with Oxygen Deprivation. She lived in Glenfield with her Mum and Dad and Sister. She went to the local Play School when she was 3 years of age. She was problematic right from the word go and her Mum thought she might be Autistic. When she was 5 she attended the local primary school. When she was eight another sister was born. At the age of 11 she went to Anstey Martin High School. At the age of 14 she went to Longslade Upper School. She gained 9 CSEs but no grade 1’s. She then went to Southfields College to do a Caring for People Course which was for a year. She successfully passed the course and then went on to do a Preliminary Course in Social Care which lasted two years. Unfortunately due to several difficulties she failed the course. She decided to do office work instead. She did voluntary work at the college library for a year and then had to leave. At the age of 17 she started going to church. She learnt to type at Night School. She then went to an Employment Rehabilitation Centre and they got her a job as a packer of shoe soles. She did this for a year and a half and then she was made redundant. She then had several temporary office jobs and then she got a job as a VDU Clerk. Due to problems coping she was transferred to the packing department, packing watches. She did this for 7 years and then left due to a breakdown. As part of her recovery she went to college to do computing and gained various qualifications, which led to her becoming computer literate. She then got a job at a hospital but was badly bullied so she left. She was then formally diagnosed with Asperger Syndrome. She went on to do voluntary work at the Leicestershire Centre for Integrated Living for 2 and a half years. She left as funding dried up. Her Mum tragically died a short while afterwards and she spent 6 years living with and supporting her Dad. After that she moved into a newly built one bed roomed flat. After 7 and a half months she started experiencing Mental Health problems. She ended up in a Psychiatric hospital and she was there for just over 1and a half years. She dealt with her issues and was finally discharged in October this year. She is at the moment busy with her book writing amongst other things. I had a nervous breakdown and it was decided that I should go to Carlton Hayes Psychiatric hospital for a rest. I was diagnosed with Chronic Fatigue Syndrome. Mum took me in. She hated leaving me there and burst into tears when she was on her own. When she came half way through the week, I told her I could not stand it there and I said I would like to just come daily. Mum had a word with them and it was agreed that I attend as a day patient. Mum took and fetched me every day. I spent the days doing craft work and nobody spoke to me. At that point I had gone into complete shut down. I would not talk. They drugged me up with all sorts of tablets. One was used to treat and tranquilize psychosis (eg. Schizophrenia and manic behaviour. Mum said that I should have never been put on these drugs. She mentioned autism to them but they dismissed it. I left in the end as they said they couldn’t do anything for me. I was given a place at a day centre which offered therapy and counseling. Mum wrote to the doctor to tell him of this and that I was on the wrong medication for anxiety. I then made a breakthrough, left the day centre and started at college to learn how to do office and computer work.